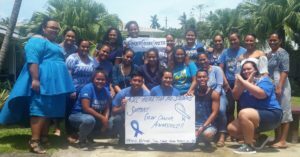 DAY 3: INSPIRE’s March “Wear All Blue” Colorectal Cancer Awareness reaches out to the American Samoa Community College. Students enrolled in Health 140 and Health 150 dress up in their blues! Some students mark their faces with blue paint on March 2 to promote colorectal cancer awareness. 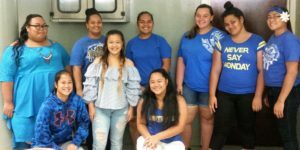 These aspiring students create signs to let the people of American Samoa know that together we can conquer colon cancer. INSPIRE was excited to hear that the health major students were ecstatic to take part in this health promotion as they learn in class the importance of maintaining good health. Thank you Mrs. Solnuu Savusa and health students for supporting the American Samoa Community Cancer Coalition in helping the people of American Samoa fight cancer.